...there are 10 developers. Each of them does very good work. They deliver solid, tested, working code. They make only very few mistakes. Only one each year. I mean the very serious errors. This makes an emergency release every month. Each new release is followed by a bug fix release. Each new feature is retarded by the emergency release of the previous feature. There are 6 big features every year. Each feature has >1 operating components. This makes 30 components in 2 years, easily 50 in 3 years. If a single components runs into problems once per year, then after 3 years operating plays firefighter every other week. But operating is already busy maintaining and expanding the operation without serious application problems. They have their own operational problems. All this makes me 10 times more paranoid. Of course you make mistakes, anyone does. We test, check, and we find and fix them. But still one per year might slip through. That's still too much. We need methods to eradicate them. My methods are paranoid programming, good architecture, expectation tests, slow down, and 4-eyes. Paranoid programming and good architecture are classics. 4-eyes is useful in extreme cases and dangerous situations. You want to drop the backup database? Ask someone else, if the statement is correct. She will notice that you are actually dropping the live database. Expectation testing means, that you plan what to expect from a test. Think of the result before you click the button. Do not interpret test results. Plan the result, make a theory, and confirm the theory. The system tells you facts. And facts are powerful arguments. They can easily convince your brain, that everything is OK. Do not let them convince you. Let the facts confirm your expectations. You are the boss. You tell what happens, before it happens. Slow down means that you do not hurry delivery. Coding should be quick, dynamic, agile. But delivery, be it deployment, delivery of results or code check-in may be slow. Take your time to think about what you are doing and if it is really brilliant. Stand up, walk around the chair, sit back, think. Take the time. It's only 3 minutes. It's nothing compared to the work before, nothing compared to the consequences of failure. The goal is NO MISTAKES. That's impossible. But if we do everything and more to make NO MISTAKES, then we might end up at really only one per year, per developer. That would be fine. 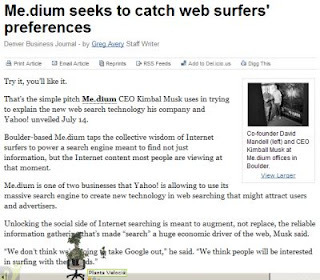 We know it all: there will be one 3D Web in the future. All virtual worlds will be unified into a single system. 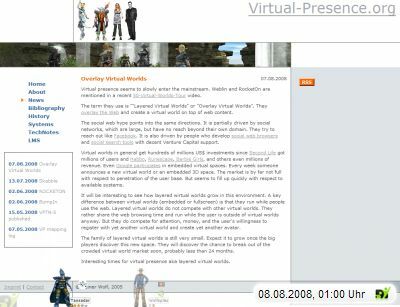 A single 3D world player will interface to many virtual worlds (VW) and there will be multiple compatible players. We know it, we talk about it, some of us even work on it. The term "walled gardens" expresses our dream to overcome the current fragmentation. But it is a dream, rather than an expectation. Because most of us in the VW domain do not really know how to achieve such standardization. We know it will happen, but we do not know how. The standardization question is wide open. Of course, some people can answer it already. Multiverse and Metaplace develop protocols with standardization in mind. They also create showcases. But the real driving force is to provide infrastructure, that others can use to create content. Their infrastructure comprises protocols, formats, and mechanisms wrapped into sample implementations. Their answer is: "use our protocol. It's been designed exactly to be used by everyone". That is probably true. But for the rest of us the question remains: which of them? Would any of the new "created as a standard for all of us"-systems drop their protocol and use another one? Probably not. 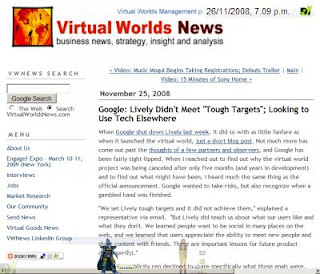 Second Life and There.com also have answers. The Second Life community just says: OGP. Others say OGP is the least common denominator. That's neither fair nor true. See how much value has been created with HTTP as common denominator. A chat protocol would be the least common denominator for VWs. A chat protocol just mediates messages. OGP is much more. OGP is feature rich. But still There.com surely finds deficiencies and has no incentive to make a transition. There.com and many other mature VWs have a well running system. Would they join OGP? Probably not. Then come World of Warcraft and other systems, which have 10 Mio. monthly paying power users. Their answer to the standardization question is: "why?". Maybe as good as "let's see". There are newcomers striving to create standards, there are mature VWs which move to create standards based on their 10% market share and completely uninterested behemoths. The current situation ist very unlike the Web where competitors dropped out quickly when HTTP arrived. It is much more like the Instant Message and Presence (IM/P) situation 10 years ago. Uninterested behemoths (e.g. ICQ, AIM), established players tweaking their protocols (SIP, XMPP), and newcomers determined to create a standard from scratch. If this is true, then there is no hope for a unified VW protocol. Extrapolating from the IM/P experience, we can expect multi-protocol VW clients with protocol plugins for individual systems. We are now running Miranda, Trillian and others and have our buddies on a unified roster. A typical protocol plugin has less than a MB of code. 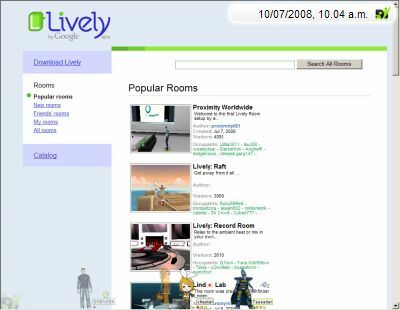 A SL/Metaverse/There client weights in the order of 20 MB. 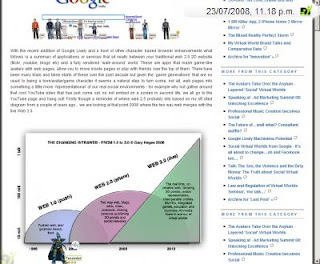 Applying a conservative Moore's law, the 500 kB of 1996 is the 20 MB of 2008. We are now talking about standardization. We go to conferences, which remind me of lively IETF meetings about IM/P standards. Some are implementing "the future standard". Some hurry to make small changes to their existing protocol to propose it as "the standard". Some just wait and see. We can expect multi-protocol clients in a few years and it will be long time until there is a common standard. Maybe 20 years from now. The IM/P domain did not get there after 10 years. But there is progress. IM/P has only been partially integrated. The roster is unified, i.e. only one client with one window on the desktop. But account-wise IM/P is not integrated. There are some big players connecting their account spaces. But it is not yet common. You need an account in every network. We can expect the same in VWs for a long time. Even with incompatible protocols we would hope for avatar unification. But it will probably turn out as in the IM/P space. Different world, different account, each one with an avatar. Primarily because of different policies. There are VWs with user created content. How would you use these avatars in WoW or a controlled There.com. If you buy something in one world and you get it for free in another, some content creators might be very upset. That's a pity for worlds which rely on user generated content. And there are technical limits. How shall engineers handle scripted clothing from SL in a world which does not support it. What we can hope for is partial integration where a world manages an avatar and other worlds can at least show it. Maybe not all features, maybe just the basics. The goal for the near future is to display avatars from other worlds. That also fits to the business model of VWs. Users remain full members of their primary world. They customize the avatar with all features offered by the world, from a user driven clothing industry to quest rewards. But they can visit other worlds with this avatar. Stromkonzerne steuern Kraftwerke nach Bedarf. Kernkraft sorgt für die Grundlast. Wind und Sonne sind Glücksache. Kohle und vor allem Gas versorgt die Spitzen. Wenn in der Halbzeitpause alle warmes Wasser brauchen fahren Gasturbinen an. In Wirklichkeit fahren die schon vorher an, weil man ja weiss, dass die Pause kommt. "Man"? "die Konzerne"? Nein, jemand. Es ist jemand, der für 10 Millionen Verbraucher mitdenkt und die Turbinen anwirft. Nicht Software, nicht ein Kommittee, nicht der Vorstandsvorsitzende, sondern einer den keiner kennt: der Geek, der Techniker, der das schon seit Jahren macht, der schon viel gesehen hat und weiss wie die Dinge laufen. Einer mit tiefem Technikwissen und technischer Intuition (auch Bauchgefühl genannt). Sicher, da gibt es viele Leute, die mithelfen. Techniker in den Werken, in den Netzen, Händler und Vertriebler, denn irgendwo muss auch das Geld herkommen für die teuren Spielzeuge. Aber wenn all die Technik, die Verbraucher, die Ressourcen bereitstehen, dann ist da einer, der weiss wie viel das Netz in 10 Minuten braucht und wo er es her bekommt. Der meldet an das Gaskraftwerk A und Kohlekraftwerk B, dass in 10 Minuten 350 MW gebraucht werden. Er hätte auch C anrufen können, aber C hatte in letzter Zeit Probleme mit der Umspannkopplung und liefert außerdem gerade ins Ausland. Wenn da beim Netzumschalten was schief geht, sinkt die Spannung in den Bereichen D und E unter 200 Volt und 10% der PCs vertragen das nicht. Deshalb lieber von A und B beziehen bis die Uptime von C wieder besser ist. Ok, F wäre auch ein guter Lieferant, aber teurer, als A+B und ausserdem hält der Wind in Norddeutschland noch ein paar Stunden, sodass der Ökostrom gerde stabil ist und die volle Kapazität von F nicht gebraucht wird. Das klingt vielleicht langweilig, aber so sind die Entscheidungswege in der Leitzentrale. Viele Faktoren, Fakten, Randbedingungen, aber auch Erfahrungswerte und Intuition. Nichts anderes bei einer guten Werbekampagne. Dahinter steckt ein Kopf, der einen neuen Trend umsetzt mit einem guten Bauchgefühl einer Idee, ein Visionär der oder die weiss was dem Markt jetzt gerade voll reinlaufen wird. Viele Mitarbeiter, Ausarbeiter, Zuarbeiter, aber eben auch ein(e) Leader(in) mit dem vernetzen Denken für die entsprechende Branche. Hinter jedem Produkt steht ein Geek. Der(die) Designer(in), Macher(in), Tüftler(in), Realisierer(in). Meistens irgendwie unbequem, unkommunikativ, exzentrisch, rechthaberisch und in den Augen mancher schwer steuerbar und potentiell gefährlich, aber trotzdem irgendwie unentbehrlich. Das ist die, die Bob Cringely meint. ...sind kein Stück besser als wir Menschen. Rote Gummibärchen als "anders" zu bezeichnen bloss weil sie eine andere Farbe haben, ist echt ungummibärlich. Die Roten sind zwar in der Minderheit, aber auch die Gelben sind nur eine von vielen Farben. Die Vielfalt macht die Tüte bunt. Wären die Gelben wirklich besser dran, wenn es nur Gelbe gäbe? Fühlen sie sich durch die wenigen Roten bedroht? Würden die Gelben wirklich besser schmecken, wenn es keine Roten gäbe? Eigentlich sollte nur der Geschmack zählen und nicht die Farbe. Und die Vielfalt. 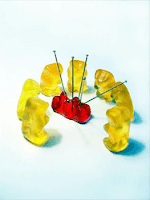 Auch Du kannst helfen: bevorzuge nicht die roten Gummibärchen. Zeige den Gelben, dass sie genauso geliebt werden. Die Bewohner der russischen Stadt Tscheljabinsk haben berechnet, wann der Satellit QuickBird, der Fotos für Google Earth und Google Maps macht, ihre Stadt überfliegt. Sie bildeten einen riesigen Smiley. Damit viele Leute kommen wurde ein Volksfest mit Band organisiert und alle Zuschauer haben sich gelbe Capes übergezogen. Und es hat tatsächlich geklappt. Das Foto ist auf Google Maps angekommen. Es sieht so aus, als ob sich die Verantwortlichen bei Google hier ganz besonders schnell waren. Normalerweise stellen sie neues Material nicht so schnell online. Vielleicht sind sie selbst begeistert von der Idee, dass eine ganze Stadt sich so ins Zeug legt. Wenn das mal keine Nachahmer findet. Citizens of the russian town Chelyabinsk calculated when the satellite QuickBird would cross above their city. 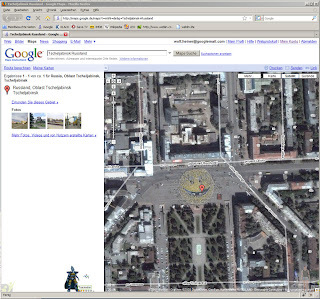 QuickBird takes images for Google Earth and Google Maps. They created a giant smiley face. A rock concert on the main square attracted many people and everyone got a yellow cape. And it worked. The image is on Google Maps. It looks like someone at Google was quicker than usual to put up the new data. Maybe Google likes the idea, that an entire town works hard to get its 15 minutes of fame on Google Maps. 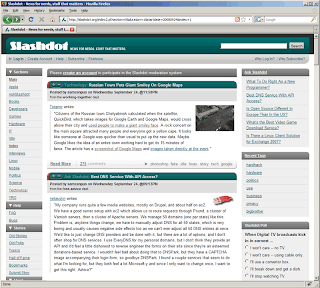 To the right is a screenshot of the Chelyabinsk city center. There are also images taken at the event. Update: It looks like they restored the original image. Maybe they do not want to encourage copy cats. After all they are trying to show a realistic view of earth and not a collage of events. SRPC-Response Format is an extension to SRPC. It specifies a request parameter which selects a response format. This is primarily intended for the REST variant of SRPC where the SRPC parameters are in the request URI and the result is the response body. Usually, the response body carries a data structure. But it is not clear in which format the data is encoded. A "Format" parameter in the request can select if the response is encoded as XML, JSON, WDDX, etc. Jeder Coder kennt die kleine Krise, wennn man zu lange an einem Programmierproblem hängt, dass eigentlich schnell erledigt sein sollte. Manchmal ist es ein Algorithmus, der sich nicht schön in geschlossener Form ausdrücken lassen will. Manchmal ist es eine Lösung die sich standhaft weigert auch alle Grenzfälle abzudecken. Manchmal ist es eine Komplexität, die sich nicht beherrschen lässt. Die Lösung der Krise wäre für den Coder ein Riesenschritt, für den Rest der Welt nicht. Meistens ist es sogar so, dass der Rest der Welt das Problem nicht sieht, weil es "nicht wirklich ein Problem sei kann" oder es "am Ende ja sowieso geht, wozu also aufregen?". Trotzdem bereitet es dem Coder schlaflose Nächte, Haareraufen, Hirnzermartern, Überstunden. Im Nachhinein gesehen ist die Lösung dann doch meistens entweder "ziemlich einfach", "offensichtlich" oder "ein Hack". Jedenfalls ist es gelöst. Der Coder ist glücklich. Aber sonst interessiert sich keiner dafür. OK, das war bisher nur Gerede. Diese zwei Absätz helfen keinem. Damit das ganze noch Hand und Fuss bekommt also hier meine Lösungsansätze. Natürlich hängt die konkrete Lösung sehr stark vom Problem hab. Deshalb hier nur Lösungsstrategien, keine Lösungen. Wie immer bei "Patterns": bitte keine Wunder erwarten. 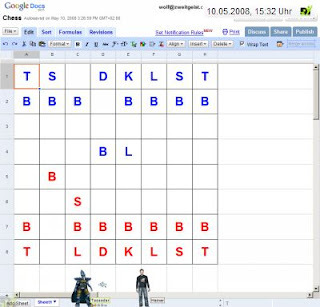 Hier steht nur was der vernünftige Coder eh' schon immer gemacht hat. Short: Replace the display of state transitions with a display of the state. Description: If a system has a complex state and if the state is displayed, then state transitions can be shown by changing the display according to the state transition. But sometimes there are too many possible transitions, similar, but different transitions, transition variants, so that changing the display to reflect the change of the model might be too complicated. Also: testing is very difficult, because all transitions (e.g. by user input) must be tested. If anything changes, then testing all transitions must be repeated. It is difficult to keep a the display consistent with the model, because changes are applied to both. They do not depend on each other. A model-view architecture surely helps, but introducing MVC might be a disruptive architecture change. So, the simpler solution is to redraw the complete display on each model change. If a state transition changes the model, then just repaint the screen. Variant: If repainting is not feasible, e.g. in case of HTML user interfaces, then rearranging all elements to reflect the model's state is equivalent. Short: If special cases prevent a closed solution, then treat them separately. Description: An algorithmic solution might be difficult, because of context dependencies, special cases, or edge cases. They can make the algorithm complex. Complex algorithms are not good. 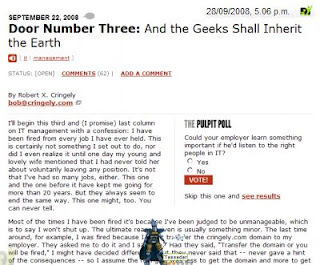 algorithms should fit on a small page. A solution is to create the core algorithm as if there were no special cases. Then fix the remaining cases separately. A typical solution then starts with the core algorithm. If that is understood and tested, then work around it. The core algorithms could be followed by an additional code section that "fixes" wrong results of the core for special cases. There can ba multiple consecutive such fix-sections. Try to identify the core and then classes of deviations from the core. Then make all individual code sections starting with the core. Do not try to mix special cases into the core algorithm. Comment: This approach is known as Perturbation Theory in physics. The first order solution is linear and understandable. Higher order solutions add special detail, but are more difficult to comprehend. Therefore they are split fom the first order and added later when the first order works. Short: Reduce complexity if possible. Description: Structure is usually a good thing. But structure also makes solutions more complex. A single layer of hierarchy might make a problem just the bit too complex for the coder to understand it easily enough to derive a simple solution. If you strip away complexity, then you use features or potential features. Even features you might need or find cool or need in the future or might need in the future. Ask yourself: could it be simpler? The answer "no" is forbidden, because anything can be simpler even though you might loose something. The question is: do you loose something that you really need NOW. It might be, that you can even generalize and undo the simplification later. The problem is now. It must be solved now. Do not solve future problems. Just try not to inhibit future extensions while doing the simple thing. - could it be simpler? - the answer is "yes, but..."
- what would be missing? - does it hurt now? - does it hurt later? if yes, does it damage the structure so sverely, that it can not be fixed later. - do I really need the full implementation or is a solid API with a fake implementation behind good enough? - does it really have to be a dynamic registry or could we hardwire the modules and just pretend to use a dynamic list? Then, get rid of it. Short: Throw it away and do it again (applies only to small pieces). Description: Sometimes we produce much code over time. Sometimes very quickly, because a problem has many special cases. Sometimes code accumulates slowly. Anyhow, the result is not understood anymore with all side effects. Each additional feature which must be added, can be a nightmare. Either for the coder who wants to guarantee that "the old mess + the new feature" is still working or for the user who gets random behaviour occasionally. All these are symptoms for a system that is out of control. The same applies to algorithms. This is about solving small problems, not about systems. In case of systems there is no easy way to redo everything. But algorithms and few pages of implementation can be recreated. A new implementation might even get rid of the ballast that was added, but is not used anymore. Comment: Start Over is a valid last resort to comply to the holy principle of "understand what you are doing". You must completely understand what you are coding and what it does to the data and to users. If you do not understand what you are changing or trying to fix, then you should make it so that you understand, even if that means to write it again in your own words. Select code, copy to temp file, press delete. Short: Do not spend much time on the solution. Find a solution quickly. Description: Do not spend more than 30 minutes on a single algorithm. Do not think too long about a solution. They do not pay you for thinking. They pay you for coding. Programmers spend their time writing I/O, error handling, initialization, synchronization, testing. There is no time to brood for hours, because there is so much else to to. Maybe you can find a solution instead of squeezing it out. A similar problem has already been solved. There is a library for it. There is a software pattern. There is a similar service, that must have had a similar problem. Find the similarity and find out how they have done it. Generalize your problem. What is the core of it. What are you really doing. Abstract from your class names and marketing labels. Then try Google. Description: There are all kinds of difficult problems. Most can be reduced to a series of smaller problems. But some withstand reduction, because "everything depends on everything else" and "a small change makes a big difference somewhere else", especially if the "somewhere else" is the marketing department. If a problem has too many (or unclear) requirements, then it might end up in a complex solution after a long time that does not benefit anyone, especially not future coding performance. A complex solution is an indication for a difficult problem. The possibility to create a good code structure indicates a good problem. On the other hand, the lack of a cool code solution indicates lack of a good problem. The problem might not be understood. Simplify the problem. Check what you really need. Use external solution proposals as a description of the real problem, rather than an implementation guideline. Re-create the real problem and make up your own solution. Comment: It might be necessary to convince the product owner that what she really wants is something different than she talked about. Find the core of the problem or find a better problem. Convince them to change the task. Sieht nach ausreichend Schlaf aus, aber das Mittagessen ist etwas unregelmässig.